This stylish and sprawling bistro is one of Highland Park's top dining destinations. 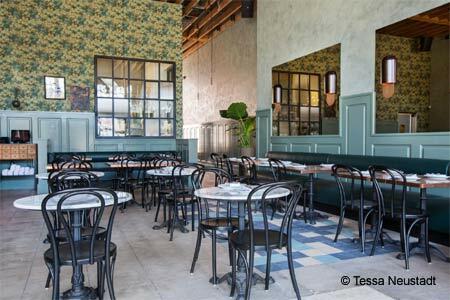 : Highland Park is on the fast-track to becoming LA’s next "it" neighborhood, and the central stretch of Figueroa is now a hip destination for dining and nightlife. Situated next to the historic, revamped Highland Park Bowl, Café Birdie is a sprawling 160-seat bistro helmed by chef/partner Joey Booterbaugh (The Hungry Cat). 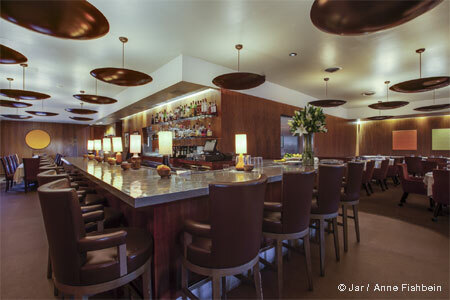 It’s an airy spot in a classic 1920s building, with copper and marble tables, a long bar and wrought iron stylings. The local crowd emits a laconic Eastside energy, and it can get a little loud. Craft cocktails are pretty and refreshing, though sometimes on the sweet side. The elegantly comforting Cal-Med menu offers seasonal pastas, salads and some ambitious bistro dishes. We admit to being smitten with mushroom toast topped by chanterelles, crème fraîche, garlic and pecorino, heaped generously on smoky grilled bread. (The uni-burrata version is equally seductive.) A citrus salad is memorable, bright with contrasts of texture and flavor marrying avocado, fennel, tarragon and pistachio. Pappardelle and pork cheek ragù is pleasingly rustic and hearty, while a nicely grilled filet of trout is accompanied by a delicate mélange of pea sprouts, pickled haricot vert and Niçoise olives. A charming, atmospheric brick alley out back is a fine spot to linger over mascarpone cheesecake with an amaro for dessert. Pop in for brunch to enjoy dishes like Moroccan-spiced fried chicken and wild mushroom soft scramble. Good Housekeeping is the restaurant's alternate standalone "speakeasy" bar tucked away behind the patio --- for a great cocktail go here --- there's candlelight, brick walls, period glassware and Manhattans. It's cozy, intimate and you won’t want to leave.